we have just begun the adventure of looking into buying a house. yesterday morning we did our first walk through of a prospective property. turns out it has a cracked foundation. we could see daylight through it. such a rollercoaster! before we went in we were excited about the neighborhood and getting out of our apartment, so it was a letdown. then in the afternoon we took a drive and checked out a few more houses, mainly just scoping out the neighborhoods to see if we even wanted to schedule a time to peek inside. we found one we really liked and got excited again. hardwood floors! two fireplaces! nice landscaping! sadly someone else beat us to the punch; it is pending a sale. all of it left me quite tired last night. thankfully i had already shopped for dinner supplies. this week we are experiencing our last (hopefully) bout of hot weather. i’m so sick of not really cooking. all of the fall cooking magazines just anger me right now. i really want to make a rustic chicken pot pie, but it just doesn’t have the same appeal when it is in the nineties, inside and out. all i have basically been making this summer are salads with grilled chicken and i’m tired of eating it. 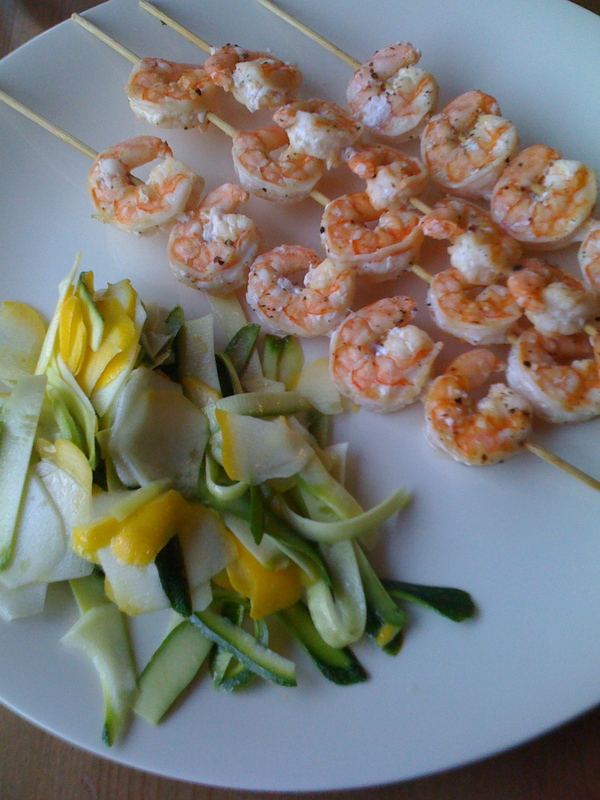 so last night i did a variation on that theme: a zucchini salad with grilled shrimp.